No visit to an art gallery would be complete without time spent sit­ting in front of a painting long enough to contem­plate the artist’s rationale, basking in the emotion the work evokes and marveling at the harmo­t1ious composition and illusive utilization of light and color. Darryl Audette, whose fine art creations in mixed media take the form of miniatures, de­serves that same atten­tion and scrutiny. Shame on the galleries that say that his work is “miniatures” and not fine art, and shame on the miniaturists who say that his work is “fine art” and not miniatures. Darryl has been caught in this web of fallacious nomenclature since he first put knife to putty 20 years ago. His ulti­mate ambition is to have his miniatures exhibited in an art gallery, accepted as fine art. Unfortunately, many art galleries tend to stereotype and trap artists between para­meters, stifling both creativity and originality. Those who are followers are oblivious to this par­adigm. Those who are leaders have always en­dured the consequences. Fine art and miniatures can be one and the same, insists Darryl, who me­ticulously researches his subiects and executes his ork with dtermf- ‘ nation and precision. 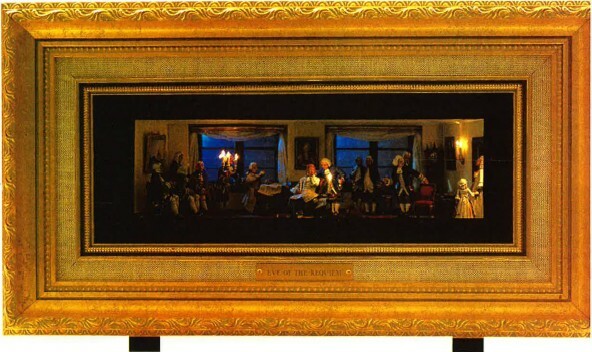 Eve of the Requiem is an Audette diorama that freezes a moment in time, capturing Mozart, who has been compos­ing his requiem, pausing for a break. In the scene, the great composer playfully puts his foot on his cat’s back while his young son crawls toward the animal to play. Attending musicians draw their bows from violins and cellos and the pianist lifts his hands from the keyboard. As Mrs. Mozart and a child enter the room, one of the patrons offers her his chai:i;.’ Patrons and friends interact through­out the room, pausing from the demands of rehearsal. 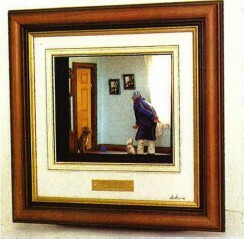 His ultimate ambition is to have his miniatures exhibited in an art gallery; accepted as fine art. 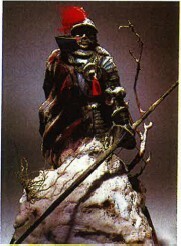 Audette’s artistry with light and shadow transcends two dimensions in his diorama, Eve of the Requiem. An ornate frame showcases his gallery-worthy work. Mozart pauses for refreshment during a rehearsal, sur­rounded by musicians, · friends and family. The scene is in 1:32 scale. Their powdered wigs and garments may be similar in style, but each figure in the setting is unique in terms of facial expression, posture and body language. Each begins with a white metal casting. Darryl cuts the casting apart and re­assembles the body parts, using Plasticine to allow for experimental ma­nipulation of arms, legs and neck. When the desired pose is achieved, Darryl replaces Plas­ticine with epoxy cement and putty, then sculpts fabric folds, costume details, wigs and facial expression with more putty. He follows a coat of acrylic primer with acrylic underpainting in the final colors. Next Darryl uses artist oil colors, carefully control­ling color value so that a fabric fold is darker at its depth and lighter as it approaches the sur­face and the light. He sprays his figures with a coat of matte varnish, then applies gold but­tons and cords, using a paste made from gold powder and bronzing liquid. Black and brown paint add definition and depth to the braid. Darryl secures the figures into position in the completed roombox and finalizes electric wiring. The carefully controlled lighting creates a compelling atmos­phere. The viewer per­ceives the scene to be lighted by six candles whose flames cast a soft light on their surround­ings. But that flow of light is created not by the candles, but by 12 volt spotlights hidden from view behind the inner frame, and by the light­ness and darkness of the oil paint used on adjacent figures. The chiaroscuro is both real and perceived. Darryl further controls light quality by tinting bulbs with theatrical gel to achieve a warm yellow tone for candle­light, and a blue cast for the moonlight that floods in through the windows. Undaunted is a 1: 12-scale knight in full armor on a barren landscape. 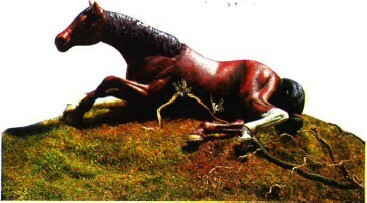 In recent years there has been an increased demand for his horse sculptures. “The wild horse represents a soul and character that I want to portray,” said Darryl, who wants to capture great moments in sports that involve horses. He freezes their likenesses in motion or repose with an under­standing of anatomy, musculature, movement and body language that brings vitality to his work. 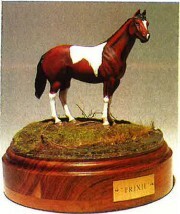 Audette’s Trixie, a portrait sculpted in larger scale, shows a recent direction in the artist’s work. This self-taught miniaturist worked full time as a denturist in a successful business he owned and operated in St. Boniface, Manitoba. Between patients, when time allowed, he worked on his figures at the office. At the pinnacle of a career that just wasn’t satisfying his personal goals for artistic achieve­ment, he made a mo­mentous decision to sell his practice and devote his life to what he loved best, creating miniatures. Summer Friends depicts an awakening horse with monarch butterflies in the nearby branches. Another diorama is com­pleted as a 1: 1 2-scale wall-hung shadow box. “I believe with all my heart and soul,” he con­fided, “that through the medium of miniature, just as with the media of painting and photog­raphy, one can express emotions and commu­nicate with the viewer.” Critical of the contem­porary art scene, Darryl feels that meaningful communication is sadly lacking. “We have be­come a comic book society,” he concluded with a note of sadness. Darryl’s courage to leave the security of a lucrative profession and concentrate on earning his living from his art at a time when Canada’s shaky financial status is adverse to such a decision proves his dedication. His success will benefit the world of miniatures. Darryl’s work is either commissioned or purchased by collectors on comple­tion. He can be reached at 3 Blue Heron Crescent, Winnipeg, Manitoba, R2C ON1, Canada. Phone: (204) 222-3822. Pat Ostovar is a contrib­uting editor to Miniature Collector. 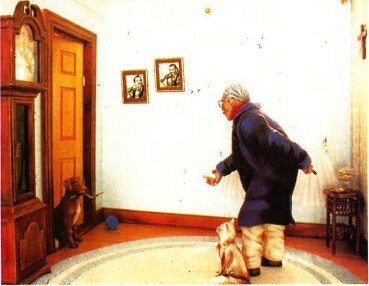 An avid minia­turist, she was a cofounder of Canada’s Annual juried Show of Miniatures.